Joseph Edward DeLaurentis, MD passed away on November 8,, 2018 from pulmonary fibrosis, just shy of his 96th birthday. He was born to Joseph and Maddalena DeLaurentis in Wayne, Pennsylvania. A graduate of St. Joseph’s College in Philadelphia, he received his medical degree from Southwestern Medical School in Dallas thanks to the GI bill. 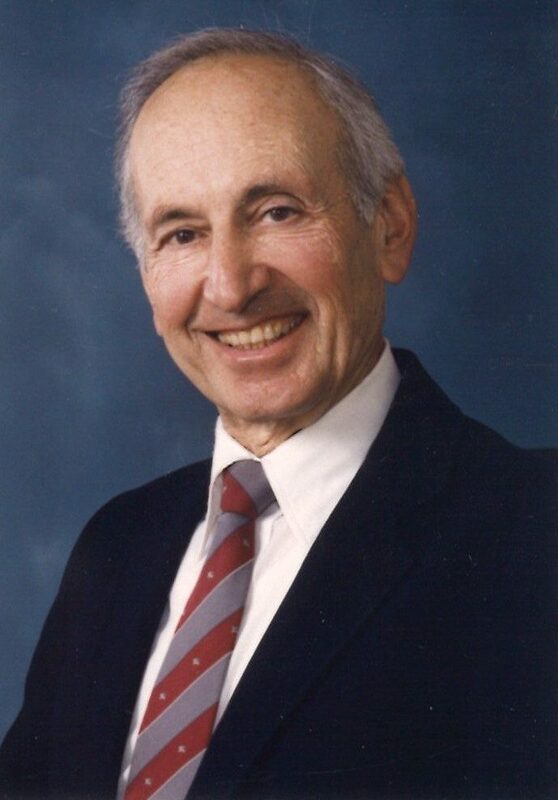 He served in the US Navy from 1949-1952 after which he began his career in industrial medicine at the DuPont Experimental Station, serving as Director of the Medical Division until retiring in 1983. He continued working, first as a consultant for DuPont, then part time at the Edgemoor Plant until 1995. Joe enjoyed golf, tennis, reading and spending time on the beach in Stone Harbor, NJ with his devoted family. He was a man of great faith who attended daily mass until his illness prevented it. He is survived by his loving wife of 71 years, Ethel Lillie (Lil), whom he adored. Other survivors are daughters Justina Pedante (Domenic), Donna DeLaurentis (Richard), Gilda Gallo (Clarence), son David, grandchildren Thomas John Shopa, Jr. (Valeriya), Andrea Sereni, Cara Shopa, Timothy Shopa (Laura), Nicholas Shopa (Mark), Mark Pedante (Emily), Leanne Pedante (Miles), Nicole Leitner (Ben), Joseph Gallo, Ben DeLaurentis, Max Gallo, Christina DeLaurentis, and great grandsons Bruno, George, and Bernard Shopa, and Cary Pedante. The family would like to thank the staff at Rockland Place for the loving care Joe received this past year, as well as the staff at Seasons Hospice for their care and support in his final days. A viewing will be held on Wednesday, November 14, 2018 beginning at 9:00am followed by a funeral mass at 10:30am at St. Joseph on the Brandywine, Greenville, Delaware. Burial will be private. Tom and I send our love and prayers to Aunt Lil and cousins. I have so many happy memories of Uncle Joe. He was such a wonderful and loving person who always made you feel so special. My heart hurts and I will miss him forever. Joe DiLaurentius raised an amazing family, including his devoted daughters, who are continuing his legacy of giving back to their community. Have many fond memories of Joe and His great Family! Sending love and comfort to you and your family Donna. I remember your father fondly from our days at Marymount. Joe was a good man. All of his friends from EPGASH golf will miss him. My prayers are with his family for their loss. My thoughts and prayers are with your family. Joe was my Godfather, and my Father's best friend. I had so many fantastic days and weeks at the shore - spending time with Joe, Lil, Gilda, LoSing (sp?) and your family in Stone Harbor. Joe tending to all kinds of minor medical issues of mine whenever I asked, up through my teenage years! Joe and Lil giving me special "Godparent" gifts as a little girl. Lil was the light and the fireball, Joe was the quiet, tender soul. Many meals, many laughs, many afternoons on the beach, Joe asleep in the sand. I see these all clearly, and will always cherish them! I think my brother Chris and I saw Joe and Lil last about three years ago, Joe immediately sharing stories about Ruffy, Lil recounting crazy kid activities. And on that afternoon, while they shared stories, I became that little girl again, tears welling, smile beaming. What a life they gave us all, and you to them. Peace. Gilda and Clarence- May God bless you and your family at this difficult time. Thinking of you and praying for your comfort.